March 29 networking event features local business owners and award for ‘Entrepreneur of the Year’. 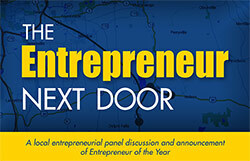 Cazenovia, NY (March 10, 2017)—Cazenovia College will host 'The Entrepreneur Next Door' panel discussion and networking event on March 29, from 6:30 to 9:00 p.m. in the Morgan Room of Hubbard Hall on the Cazenovia College campus. For directions, go to www.cazenovia.edu/directions. Moderating the panel discussion will be Jason Emerson, editor of the Cazenovia Republican. Panelists include Ben Giordano, FreshySites Website Design; McKenzie Hughes Houseman, Cazenovia Cutblock and 20|East; David Katleski, Empire Brewing Company; Kevin McGreevy, Cazenovia Bagel Company; Ben Reilley, Life of Reilley Distilling & Wine Co.; and, Jackie Wilson, JES Apparel. The event is open to the public. Please register for your free ticket at www.cazenovia.edu/entrepreneur-tickets. The event will also include the presentation of the Cazenovia Area 'Entrepreneur of the Year' award—given by Cazenovia College with the support and collaboration of the Cazenovia College Alumni Association, the Cazenovia Area Community Development Association, Cazenovia Chamber, Cazenovia Republican, and the Small Business Development Center at OCC. Andrea Collella – From The Ground Up Therapeutic Horsemanship, Inc.